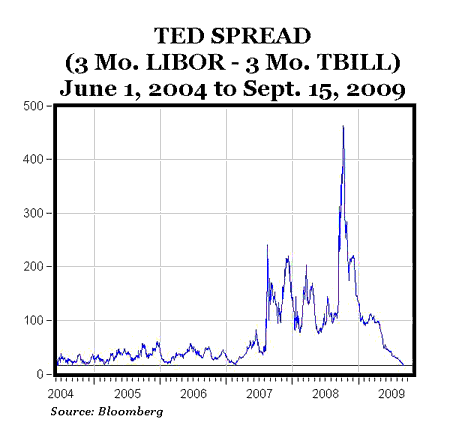 The TED spread is the difference between the risk-free three-month T-bill interest rate and three-month LIBOR (includes a credit risk premium), and is considered to be a good indicator of the overall amount of perceived credit risk in the economy. A year ago on September 15, 2009 the TED Spread jumped by 65.5 basis points (from 134.855 bps to 200.3588 bps) as Lehman Brothers filed for bankruptcy and fears about credit risk soared. Two days later on September 17 as fears about credit and financial risk intensified, the TED Spread jumped by another 82.6 basis points (bps) to more than 300 bps, setting a new record (back to at least 1990) for the largest one-day increase in the TED spread (that record still stands), and setting a new record for the highest TED Spread to date. At the height of the financial crisis about a month later, the TED Spread hit 456.485 basis points on October 13, 2008, an all-time record. As the credit and financial markets have gradually healed, the TED Spread has fallen by more than 450 bps to the current level of about 15.75 bps, the lowest level in more than 5 years, since June 8, 2004 (see chart above). One more sign that the recession has ended. Has the Recession Finally Bottomed Out?